Author: Crane, George Set In . 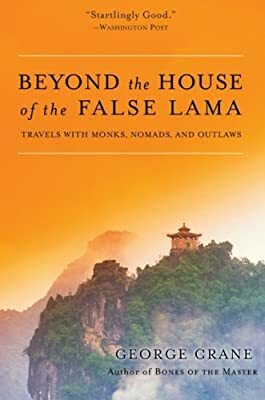 . .
Lama, now in paperback, traces Crane's adventures as a writer, wanderer, and anarchic but still failing student of Zen. It begins in 1996 at the edge of the Gobi Desert in Inner Mongolia, where he and his teacher and friend, Zen Master Tsung Tsai, are forced by a sandstorm to end their quest to find the lost temple at Two Wolf Mountain. It continues with a harrowing, near disastrous attempt to deliver a ratty, 58 foot ferrous cement sailboat to Granada. Setting sail from Key Largo into the heart of hurricane season, with a crew of eccentrics and outlaws, led by the infamous Captain Bananas. They run with a disintegrating sailboat into the perfect squall. The tale ends in the winter of 2003, when after weeks of desert travel, Crane and his companions–––the nomad Jumaand and the young, beautiful Mongol girl Oka, his bed mate and bodyguard–––stand beneath the remote cliffs of Delgaz Khaan in Outer Mongolia's South Gobi. Here, Crane, after burying his long dead father, sets out on a new quest, looking to find what the nomads call Windhorse, "the beginning of the wind," but finds what every nomad knows, that every road is more a direction than a destination.